Lim (third left) honoured at the Global Leadership Awards 2018 with the Lifetime Achievement Award presented by Deputy Minister of Home Affairs Datuk Mohd Azis Jamman (second left) and ALDA founder Arthur Carmazzi (fourth left) joined by The Leaders International Magazine CEO Shahul Hameed Dawood (left). KUCHING: LBS Bina Group Berhad (LBS) Group managing director, Tan Sri Lim Hock San was accorded the Lifetime Achievement Award and Leadership Excellence In Property Development Award at the 8th Global Leadership Awards which recently gathered leaders across the region to highlight and award exemplary leadership practices that continue to drive corporate, community and nation development. 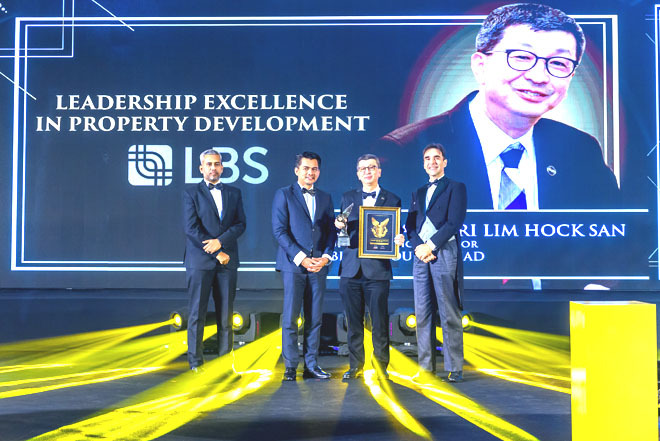 Accepting the award, Lim said, “LBS has been building homes for Malaysians for the past 27 years. This is a mission for us and it continues to this day because we want to help the nation achieve its agenda of helping more Malaysian’s own homes. The award-winning township developer is a familiar name when it comes to pushing the affordable home agenda. Believing this to be an area of importance, LBS has delivered over 33,000 homes to date which include homes developed under government housing projects. Amidst a challenging market outlook, LBS has proven that its solid strategy for the year continues to keep the group on track to achieve its business target of RM1.8 billion in sales by the end of 2018. As at June 30, 2018, the group’s unbilled sales stood at RM1.704 billion with a landbank size of 3,844 acres, worth RM30 billion in Gross Development Value (GDV). “I am humbled by this award. It is a reflection of the hard work of the LBS team. The dedication of the team and our clear vision continues to keep us on track to achieve our goals. “Most importantly, we want to inspire upcoming corporations and leaders to keep the needs of the nation and the community in sight as they pursue their business goals,” said Lim. The 8th Global Leadership Awards 2018 was organised by The Leaders International, a high profiled business magazine endorsed by the American Leadership Development Association (ALDA), a US based NGO which showcases leadership globally. The Awards recognised industry captains who displayed excellence across 28 award categories including agriculture, automotive, banking and finance sector, education sector for private and public university, engineering, healthcare, food and beverage, e-commerce and property development among others.